WARNING: This bot will double your social media traffic while saving you hours upon hours on social media management. If you're ok with that, let's go. “It’s like a magic wand for social media management, except the wand waves itself.” - Zac Shaw. Now I’m going to show you exactly how I grew my engagement 1000x by recycling my social media updates with a bot. Let’s dive in with a flashback. In 2009, Laura started LKR Social Media, where she taught thousand of entrepreneurs and marketers how to take their social media marketing into their own hands. One of her most effective strategies in her bag of tricks was recycling social media updates. On average, her students were seeing a 95% increase in their social media traffic. Doing this meant creating a content library, preferably in a spreadsheet. But there was one problem - recycling the content meant manually loading them into a scheduling tool over, and over, and over again. Pretty tedious! Even worse, some scheduling tools, like Buffer, limit the amount of content you can schedule to just 10 posts. That’s probably 2 days worth of content for some of us. Long story short, recycling social media updates brings incredible benefits, but managing social media is extremely tedious. Laura’s answer was to build Edgar. A tool that endlessly schedules your social media. Thereby keeping your profiles fresh, while refilling itself without your input. What if there was another way? What if you could hire a social media manager that takes content from your content library and loads them into the scheduling tool you already use, every day? They come up with some quotes, write updates linking to their blog posts, think up some questions to keep people engaged, and so on. Then they’d either pay someone an hourly rate to load up these social updates into a scheduling tool or directly on Facebook or Twitter. Finally, they repeat this whole process the next day, or the next week depending on the plan on their scheduling tool, otherwise, their social media channels would go silent. 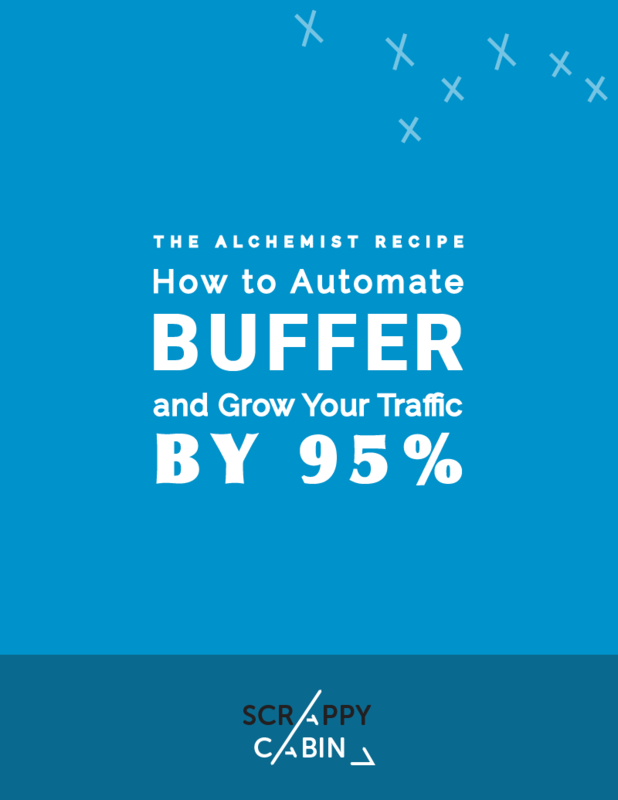 Introducing the Alchemist: The bot that has the power to turn a free Buffer account into Edgar (hence, the name). Saving you hundreds of hours per year, so you can spend time where it really matters - engaging with your audience. Getting 10x more mileage out of your messages with zero effort. Reducing the need to pay for ads all the time. Each time you recycle a post, it will be seen by new parts of your audience. Doubling your social media traffic and engagement. Never run out of posts on your Buffer queue. Even when you have the free plan that limits you to just 10 posts on the queue. Allowing for more and more intentional posts, because you aren’t rushed to get something up between a client call. The next section is the step-by-step tutorial on how to install the Alchemist on your computer. From the feedback I’ve gotten so far, it’s a bit techy, If you’re not comfortable with that, some of you have suggested I create a web version of the Alchemist. Click the button below to join the waitlist. How to setup the Alchemist. If you're using a Mac, you will already have Ruby pre-installed on your machine. Create a folder called "bots" on your Desktop. Unzip the file and place its contents in the bots folder on your Desktop. Every bot on Scrappy Cabin to help you automate your way to freedom will be nested in this folder. Download the Atom code editor. This software will allow you to edit the code. Open the source code in Atom by opening up the Atom editor on your computer, click on File > Open. Select the bots folder on the Desktop and click the “Open” button. Open up the config file. In the same config.rb file, you’ll see three variables for Buffer. $CLIENTID, $CLIENTSECRET, and $ACCESSTOKEN. Name: The name of the app will show up on your social media profile. Description: It’s just for you. Homepage: Put your website. You can also put any website, you can even put https://www.scrappycabin.com if you don’t have one. Then hit the “Create Application” button. You should now see your $CLIENTID and $ACCESSTOKEN. Your $CLIENTSECRET will be sent to the email you registered your Buffer account with. Now fill in the keys in the config.rb file as you did with $GOOGLESHEETKEY. For the instructions below, copy the commands, paste them on your terminal (Mac) / CMD (Windows), and press enter. Open up your command line by searching for “cmd.exe” on Windows or “terminal” on Mac. Then navigate to the bots folder. Finally, we're good to go. Still there with me? Copy the format of the spreadsheet above in your Google Drive. PS: It's important that you do not change the order of the columns. Go to your Buffer account and schedule posting times based on the number of times you want to post per day. You can also use this tool by Buffer. For example, if you want the alchemist to schedule three posts per day, then you’ll have to add three posting times. If this question comes to your head, “Do I have to open the terminal/command line and run the command “ruby app.rb” every day?”, you’ve been following along nicely. Introducing Cron Jobs, AKA how to tell a computer to do run a task as frequently as you want it (i.e. every day, every hour, at 1 pm every day, and so on). Finally, follow the wizard, and Windows will help you get your job set up! Cron jobs require your computer to be awake. If your computer is off or asleep, the cron job will not run, hence the Alchemist will not work. This is a perfect job for a web server that’s constantly awake. And that’s why I’ve decided to turn this bot into a web tool (website) that’ll help you maximise the life of your content by continuously sharing it on social media at a perfect frequency and keep your audience aware of and engaged with your brand. All these at the click of a button. As they say, you’re just one content away from reaching your wildest business goals. But instead of hoping people gravitate towards your content because it’s the best content out there, you can take matters into your own hands by sharing them on a recurring schedule. Over time, you can now reach every single person.